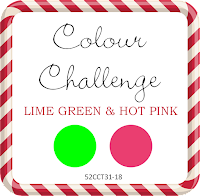 The is our monthly colour challenge at 52CCT - Use Hot Pink and Lime Green. I can remember when these were the “hot colours” when I was in high school in the early 70′s (oh my, this dates me!). I am using a fun digis from Bugaboo Stamps that I coloured with Derwent Inkintense Watercolour Crayons. Join us each week, and we will help you build your Christmas stash!